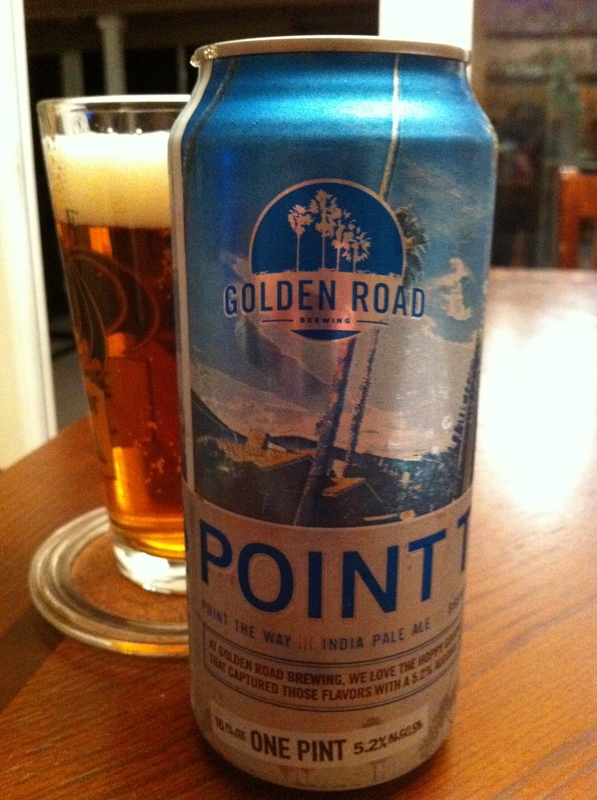 Golden Road Brewing is one of the newest craft breweries here in Los Angeles. Created by Tony Yanow (of the CA-centric beer bar Tony’s Darts Away) and Meg Gill (formerly of Oskar Blues) the two of them have decided to make environmentally friendly (they can their beer), easy drinking craft beer. Their signature beer is the “anytime beer” POINT THE WAY IPA. 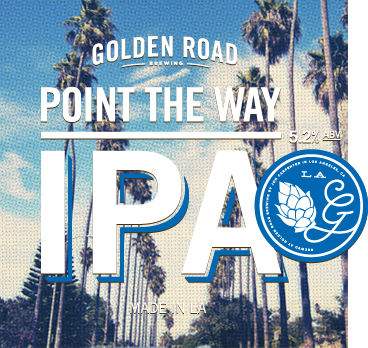 Point the Way IPA is an American IPA made for drinking anytime, anywhere. Available on tap and in 16 oz. tallboy cans, this beer has 60 IBUs and a 5.2% ABV. A mild, low alcohol IPA that you could drink all day, any day. This beer was one of the reasons we opened Golden Road. We wanted to bring some California hoppiness to a beer in the traditional IPA range. Point The Way weighs in at 5.2% ABV, noticeably lower than most IPAs, which tend to start around 6.5% ABV these days. The flavor has a light, fruity quality to the hops, befitting what Brewmaster Jon Carpenter refers to as a “simple, straightforward beer.” He credits the hops, some of which come from New Zealand Hops Ltd. for the beer’s fruity aroma. We had planned to have some friends over to watch a popular sporting event and I realized that I was going to need some beer to keep me hydrated during the game. What better way to celebrate a beautiful day in Southern California than by drinking some craft beer brewed right here in LA! After drinking one straight from the can, I cracked open a second can and poured the clear copper liquid into a pint glass. Light carbonation made its way from the bottom of the glass up to the half-inch of thick foam floating on the surface. The nose is fruity and sweet. A smell emanated that made me think grapefruit juice with pine needles soaking in it. Notes of pineapple are present and are more noticeable outside of the can than in. Whereas the fruit was first and the pine second in the nose, the flavor is the opposite. Piney hops hit first with a faint burnt taste. The grapefruit and pineapple both come through with a faint sweetness that isn’t nearly as dominate as I would have expected (or wanted). A vegetablyness is present (kinda like asparagus or green beans) and it grows as the beer warms up. The ending has a Sprite like zestiness that adds a crisp citrus bite. Mouthfeel is light and carbonated. However, there is a dryness that comes with any hoppy IPA. Point the Way is a very unique IPA. The vegetable flavors add a dimension I haven’t really seen before (which is good), but also would make it hard to session (which isn’t as good). I’ll have to look for those same flavors the next time I try this beer on tap.